The nerve entrapment syndromes are an important issue in microsurgery. Microsurgeons need to be able to recognize and choose the best approach to each case. Advances in endoscopy have led surgeons to use this method to release nerves, achieving the best results by using a minimally invasive procedure. 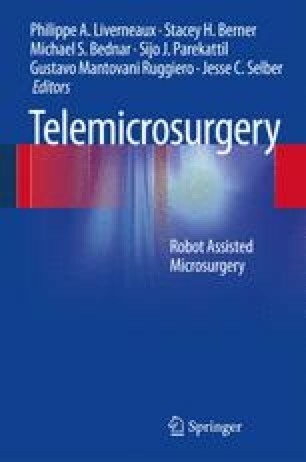 Recently, the robotic surgery has also been introduced as a new surgical possibility presenting the following benefits: best gesture control, magnification and movement scaling. The combination of both robotic surgery and endoscopy may be almost perfect for using in all nerve surgeries. The evolution is dynamic and we are sure that many procedures will change in the future from open to robotic and finally to endorobotic surgery, and others directly from endoscopic to endorobotic. We are experiencing an evolution of the surgical methods; thus we will share our current experience and future expectations in order to accomplish the state of the art in the release of the nerve entrapment syndromes. All this evolution will require modifications in the robot. Indeed, by creating new robotic tools and new technologies, the possibilities will certainly expand. The current framework for nerve decompression is presented in this chapter; however, as mentioned above, the possibilities can be expanded in the future.